Guests will feel as if they have been transported to the tranquil gardens of Central Park after stepping into the newly transformed Garden Grove restaurant in the Walt Disney World Swan and Dolphin Resort. From the center platform of the restaurant, guests will be marveled by a beautiful 25-foot oak tree which is adorned with twinkling lights and paper lanterns. During the day, families can feast in the park-like atmosphere while bright sunlight from the restaurant’s tall windows fills the area. In the evening, the lights are dimmed and the oak tree centerpiece shimmers while guests dine under street lamps that accentuate the feeling of indulging in a nighttime garden. 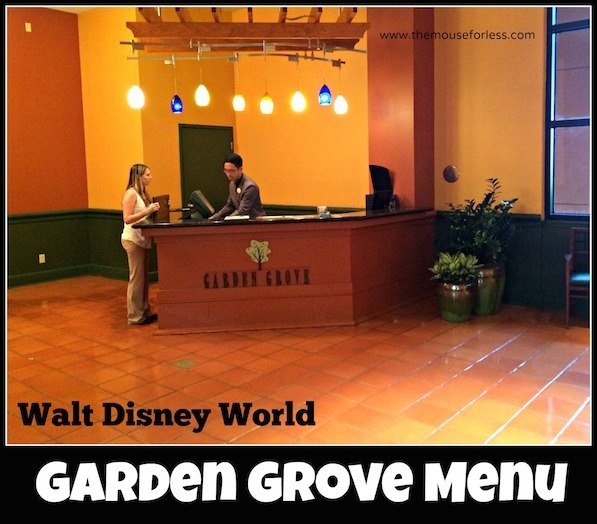 Families will enjoy the American cuisine at Garden Grove and have the opportunity to dine with Disney characters for dinner every night and for breakfast on the weekends. Disney Characters: Appearing Saturday and Sunday 8 – 11 a.m.
Disney Characters: Appearing nightly for Dinner! Garden Grove features a quality selection of “Never ending” soups; We also offer our “Toss It or Chop It” concept that allows you to choose from our robust salad bar and your choice of our house made dressings. All of our entrees prepared with care and respect. They are served with an ever evolving array of our chef’s favorite side dishes. The icing on the cake is our unlimited dessert buffet. Create your own salad from our selection of Fresh Lettuces, Raw Garden Vegetables, Pickled Vegetables while our chef’s chop or toss your personalized salad as desired with your choice of our house made dressings. Disney Characters Appearing Nightly 5:15 p.m. – 9 p.m.